Unusually early for a Saturday, I cycled off September 14 towards Sheepshead Bay, a distant corner of Brooklyn, to help out with a relief project dealing with the continuing unrepaired damage from last year’s Superstorm Sandy. 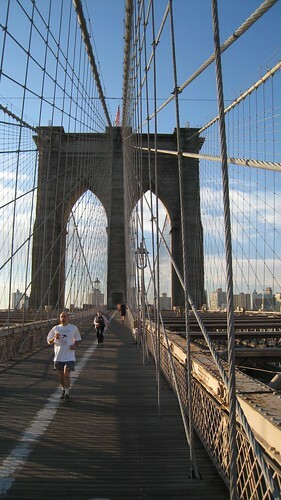 Running late as ever, I started off at a sprint over a lift bridge near our apartment that takes Brooklyn’s 9th street over the Gowanus Canal and under Smith and 9th street subway station. The subway sits high on a viaduct above. anyone would have blamed me if I'd got caught up in this. But I'm sure they'd have found a way. A couple of hours later, a large truck carrying building materials made the same journey over the bridge as I - but with a crane on its back sitting a little higher than it should have done. The crane caught a piece of corrugated iron on a vast network of scaffolding erected for a renovation project on the subway station. 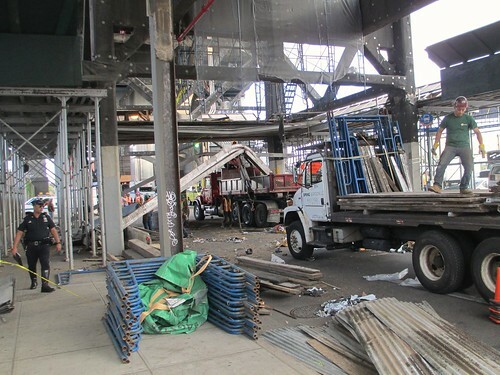 I returned from Sheepshead Bay to find 9th street barred to me and police and fire officers milling around a tangled mess of truck, corrugated iron and other bits of the scaffolding. Had I been riding over the bridge at the same time as the truck, I would have been helpless. Sheets of metal and steel poles would have tumbled on top of me, while the driver, protected by his cab, was unhurt. Yet, had I found myself crushed under the scaffolding, at least some people, I’ve come to realise, would have blamed me for not looking after myself better. That’s the implication of the response to an appalling incident on September 12 when a motorist in Maspeth, part of the New York borough of Queens, drove onto a sidewalk and hit five children, three of whom are seriously injured. One child, although initially regarded as only slightly hurt, has since died of an asthma flare-up which, the laws of probability suggest, was probably related to the crash. In the wake of the incident - captured on the disturbing video below - the school’s principal wrote to parents asking them to ensure their children avoided wearing earphones or using mobile devices when walking to school. The suggestion – not borne out by the horrific, disturbing video of the incident – was that the hospitalised children should somehow have avoided the speeding vehicle by paying greater attention. The letter – which education officials seem to have insisted the principal sent, over his objections – is all the more astounding since it makes no suggestion that parents drive more carefully – and the driver responsible seems to have been dropping his own child at the school. The education system’s reaction was far from unique. I recently read with dismay the comments under an old news article about the death in 2011 of Johannah Bailey, a cyclist hit by a van driver on Cavendish Road, part of London’s South Circular in Clapham, that I’ve often ridden myself. The van driver, Andrei Dulgher, rounded a bend in the road so fast that he drove over a traffic island before hitting Ms Bailey – on a turning lane in the centre of the road - and sending her body flying high into the air. One ostensibly sympathetic comment from someone who’d witnessed the horrific incident – which came to my attention when Dulgher was cleared of causing death by dangerous driving – expressed horror at what happened and appealed to all cyclists to “take care” when riding. How cyclists were meant to “take care” around vehicles coming round blind bends at speed in the wrong part of the road was not made clear. The scaffolding incident and the strange comment on Ms Bailey’s death have prompted me to think hard not only about how other people think vulnerable road users should behave but how I myself think. Where is the line between a crash that the victims clearly couldn’t have avoided – such as that in Maspeth or Johanna Bailey’s killing – and an incident where the victim’s negligence clearly contributed to what happened? Why do so many people place the blame so firmly on the vulnerable? How does that affect my own road behaviour? I don’t, unfortunately, need to think too hard to imagine the circumstances of a crash for which I’d blame a cyclist. It happened at 1.30am one Saturday a few months ago as I cycled home from a very late night at work. Tired and feeling stressed by the speed and volume of traffic in downtown Brooklyn, I took a rare opportunity when no traffic was on my tail to make a rapid left turn across Boerum Place’s six lanes, into quiet State Street. I’d forgotten that traffic heading the other way along Boerum Place wouldn’t have a red light. Suddenly, an SUV came tearing around the corner from Atlantic Avenue, the next intersection along, and hurtling towards me. I jammed on my brakes and the SUV swerved and also braked. Catastrophe was averted – but I could have had little complaint, despite the road’s confusing layout and the driver’s speed, if the car had hit me. I’d made a stupid – negligent – mistake. Yet, if the SUV had hit me, it would have been a relatively unusual type of crash. Every survey I’ve read, including a very detailed one from Transport for London, attributes most crashes involving cyclists to a relatively small number of causes – motorists’ failure to look properly, motorists’ failure to judge cyclists’ speed or direction and motorists’ passing cyclists too fast and/or too close. It’s not, in other words, that common for cyclists or other vulnerable road users to take suicidally silly risks or make utterly inept mistakes. The people who are hidden inside steel shells so have least to risk tend to be the biggest risk takers. I ride in such a way as to reduce my risks. I wear – unlike many of my fellow New York cyclists – a high-visibility vest and even a reflective snap bracelet, intended to help drivers to see when I’m signalling left. Convinced that protection for my body’s densest, most sensitive part must do some good, I use a helmet. I also – again, unlike a puzzlingly high proportion of New York cyclists – use lights at night, two at the rear and one at the front. When riding on a cycle lane between a line of halted or slow-moving cars and parked vehicles, I ride slowly, aware that a door could suddenly fly open or a car lurch suddenly into my lane. It’s no coincidence, however, that my efforts are designed either to help me to react in circumstances where I know drivers are likely to be negligent or actually to influence drivers’ behaviour. I concentrate on taking reasonable steps to mitigate the most serious risks. I don’t pretend that, walking on a sidewalk, I could protect myself against an out-of-control SUV hurtling towards me. I don’t believe I – or the poor children so horribly hurt in Maspeth – bear responsibility for crashes where the driver has been negligent and the victim wasn't. But the reaction to Johannah Bailey’s death perhaps explains why so much thinking on this subject is so woolly. Both the commenter and, perhaps, the jury that acquitted Andrei Dulgher probably thought of themselves mainly as drivers. That seems to create a barrier as impermeable as a car’s body shell between the driver and the complex reality of life outside the car, including its destructive potential. When that destructive power crushes a pedestrian or throws a cyclist 30ft into the air, it can be hard for motorists not to put themselves mainly in the place of the driver, rather than the cyclist or pedestrian. No matter the circumstances, there seems to be a thought that motorists drive of necessity and are a fact of life. Others have made a conscious, eccentric decision to walk or cycle – and can’t complain too much when a motorist’s negligence makes it go wrong. That thinking, it seems to me, lies behind responses like that of the New York Department of Education to the Maspeth tragedy. 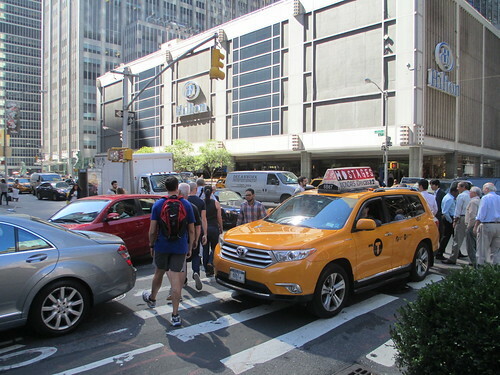 Many people seem to see cars as the natural, inalienable rights-holders in public places. 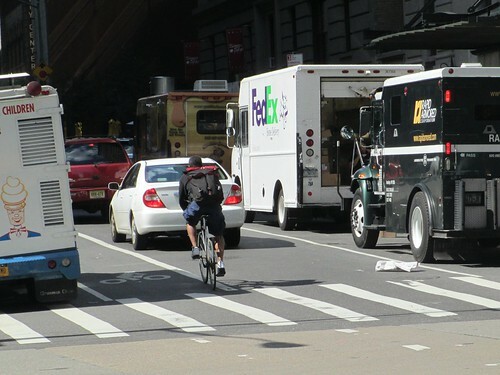 Cyclists and pedestrians are the parent-in-law house guests – just about tolerated, but only with the poorest of graces. The streets would surely be safer if more people thought of roads as places where multiple types of road users mixed, rather than places where cars drive and others fit around them. It will, ironically, be when most people think automatically on hearing of incidents like the Maspeth crash, “How negligent of the careless driver” rather than, “How negligent of the walking teenagers” that people will start to hear of far fewer happening.